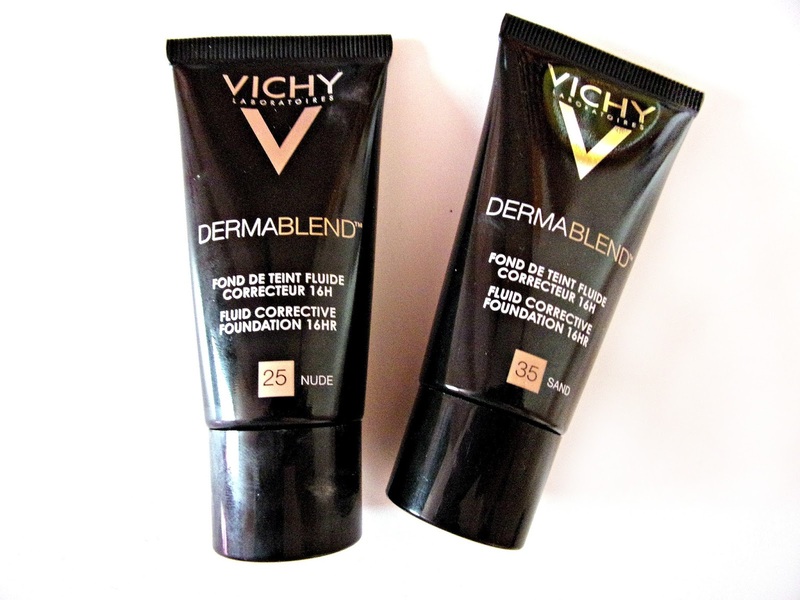 I've now been trying out the Vichy Dermablend Fluid Corrective foundation* (see here) for a few weeks so I thought it was about time I shared my thoughts with you. The foundation is marketed as a full coverage and long lasting base, however I would say it's still suitable for all skin types as you can decide how much coverage you want. They claim it blurs away imperfections such as: uneven skin tone, dark circles and redness. The foundation has an SPF of 35, at first I wasn't too concerned about whether it did have an SPF or not, however I'm actually really glad it does now for two reasons. First of all, most foundations have SPF 15 and even then it's not really SPF 15 if it's been mixed into the foundation, so having a higher factor is really the way to go. Secondly, whilst I'm a huge believer in sun cream I do sometimes not bother putting it on if it's not sunny outside and this has caught me out on a few occasions so having it mixed into your foundation does take out that worry. However, the downside to the SPF is that it won't be suitable for flash photography. I'm sure I've iterated how terrible I am at matching foundation or concealer shades (it's the main thing that stops me trying out new products), so when I was asked if I wanted to try this out I went into Boots to test them beforehand. I had looked at swatches online too but there wasn't much information on the best shades for Asian skin but I knew I was somewhere between 25 and 35. So when I did try them out 35 looked much too warm for my skin that's more on the neutral side so I settled for 25. However, when I did receive 25 it was a tad too light on it's own so I was very kindly sent over 35 too. 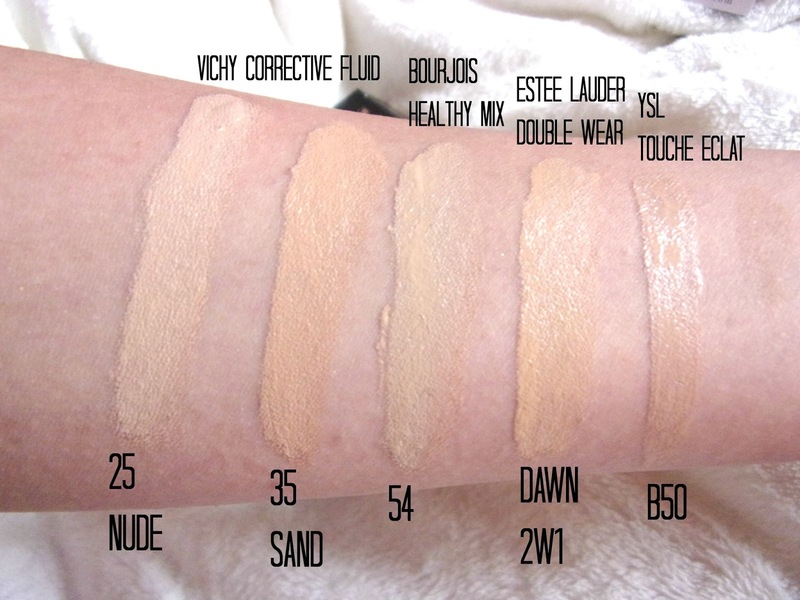 There are now 8 shades in total, and I would say 25 is for light to medium skintones, it has a slight cool undertone, and 35 is for medium skintones with a very warm undertone. I normally mix an equal amount of 25 and 35, although I was concerned that the undertone still wasn't right but there is a very slight amount of oxidation that helps it blend in with the skin better. I do think I'll go for a mix of three quarters of 25 and one quarter of 35 going forward though as the 50/50 mix was slightly warm. If you didn't want to mix shades you can always use a bronzer to warm up the lighter shade, I did this with my Bourjois bronzer and it actually turned out well, except for the shimmer particles in my bronzer. For reference I've put up my other foundation shades, my best match is the Bourjois healthy mix foundation in 54 which you can see is in between shades 25 and 35. Estee Lauder Double Wear in 2W1 Dawn is also a good match. YSL Touche Eclat in B50 was too tanned for me but it's close to shade 35 Sand. In Nars I would say I'm close to Punjab, and around NC30. Onto the application! I don't have any major concerns with my skin apart from a bit uneven skintone around my chin and some redness in my cheeks so I've been applying a light application of this. With a light layer it doesn't cover my beauty spots and a bit of my redness does come though but the coverage can be built up and it does give me a uniform base. The foundation didn't cling to my dry skin, I was actually expecting it to with such a high coverage foundation so that was good, but I do think it applies that bit smoother over a primer on dry skin. I normally prefer using a pointed foundation brush but I found that a buffing brush or beauty blender (I use an ebay version) worked better with the Vichy Dermablend foundation. The foundation applies really well and it doesn't look cakey at all, infact as overused as the term might be it really does look like skin. It lasts pretty well all day too and might need a topping up of powder if you get oily, but at the end of the day it looked like it had done when I had just applied it. I did try this as a concealer too and it just didn't look right to me, but I always go in with a separate concealer anyway so I wasn't too fussed. Overall, it's a great foundation for anyone, the high coverage claim might put some people off but with this foundation you can really control how much you want to apply and it's a lot more purse friendly than other similar foundations, especially seeing as it is on offer for £12 here for 30ml. The only drawbacks of this foundation is that it can be hard to get right if the shade isn't a good match and there was also some transfer around the neckline of my top. 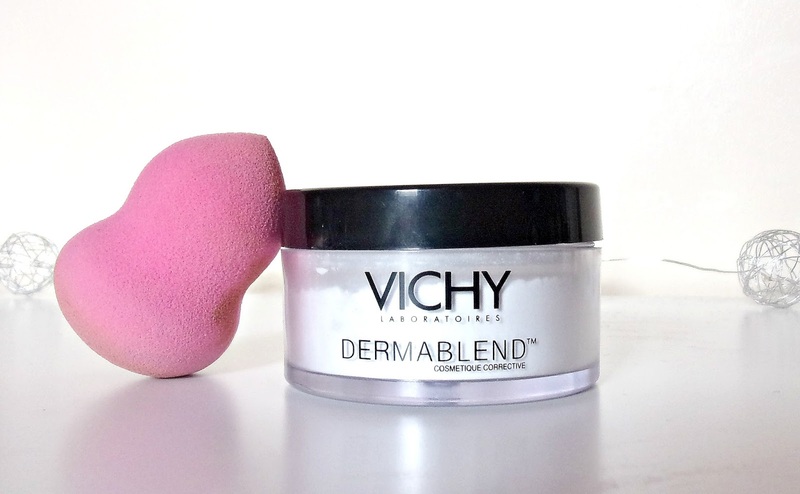 The second product I got to try was the Vichy Dermablend Setting Powder*, definitely one of the unsung heroes in my eyes! The powder is more finely milled than any other and it goes on completely colourless so there's no chance of the dreaded white cast. It sets foundation and concealer really well and softens the whole look. It also has an SPF of 30. A good setting powder can have numerous uses and I've already used this to experiment with the whole matte lips trend. A lot of my summer lipsticks have a satin or shimmery finish and I don't really get a lot of use from them, but putting this over the top mattifies them instantly without changing the colour. The only downfall of this powder is that a bit of shine can come through so if your skin gets oily quite fast it's perhaps worth considering. 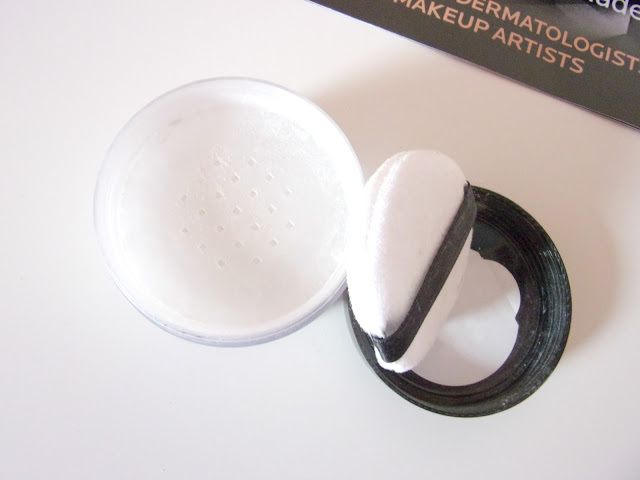 The packaging of both the foundations and the powder has a big emphasis on a sleek and monochrome theme. The foundations come in tubes where you squeeze the product out, but the packaging of the powder looks and feels a bit more high end to me. It comes in a see through tub with a powder puff included and then the little sifter where you shake it to get the powder to come out. I did give the puff a go using the 'press and roll' action I've seen in Gossmakeupartist's videos but it's a bit fiddly for me so I use an Nanshy powder brush to sweep it across my face instead. Normally I only powder my t zone but this powder is so light and flattering that I just go for it! The powder is on sale for £11.25 here. Have you tried any of the Dermablend products? I am one of them folks are turned off by the term 'full coverage'. Anything full coverage doesn't look good on me, or at least I don't think it looks good on me. I still like to see my skin or so to speak but you're right that we could control how much we're applying. Great review! It's a pity there wasn't a better colour match for you as it's such a great full coverage foundation! I really like how lightweight the powder is too but found it didn't stop my oiliness throughout the day but it did when I used it with my Revlon ColourStay! I love the look of that loose powder, reminds me a lot of the laura mercier one but it's cheaper! I haven't tried any of these before and I've never tried anything from Vichy, I think from memory they're supposed to have a really good concealer though? It is hard to get the perfect match with foundations, I am usually the in between shade. Most of my foundations are SPF15 so SPF35 is great as I always forget applying sun screen. Great review! These look like great products. I was to try the corrective fluid. I haven't tried the dermablend products before but I really want to give that loose powder a try. I have got to try that powder. Thanks for your recommendations! I absolutely love both of these products, I'm so funny with finding powders I like but this one is so good! Does the powder respond well to camera flashes? It'so hard to find a powder that doesn't! I've been wanting to try a powder like that for awhile now... thanks for sharing and introducing! I agree, I actually feel like I have protection on that way, compared to SPF 15 where I don't really see the point :) Thank you! 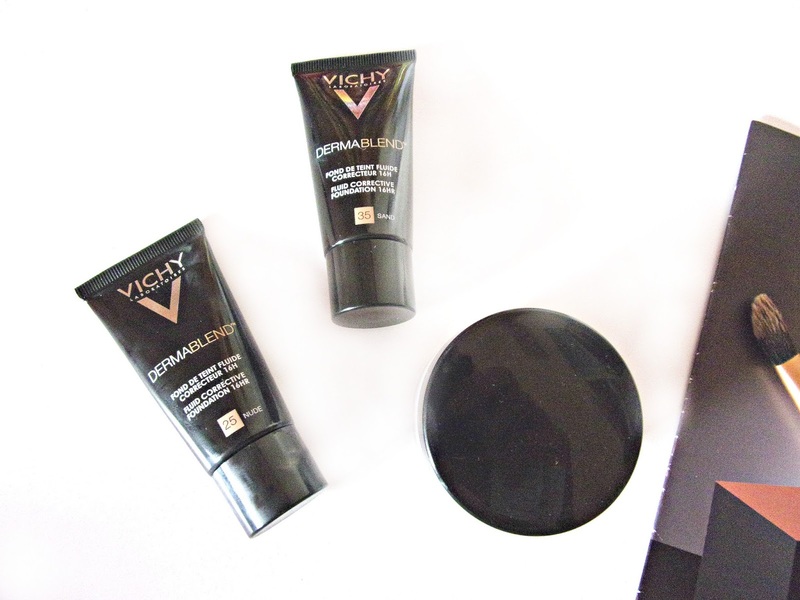 I've always been a huge fab of Vichy & have been using their products from the teenage years (oh how long ago it was! lol). The shades look neat & the fact that there is SPF added makes a big difference. Thanks for your review, darling. Love this fashion wishlist and your picks, so perfect for the transitional time! I've been wanting to try the powder. Glad to hear you like it so much! It's one of my favourite products, can't fault it really! I still haven't tried this brand! Thanks for sharing! Their foundation lines are great, and there's something for everyone! Love these products and the review is Awesome, thanks dear for sharing! I'd love to hear how you get on with it!